Building bridges between science, art and place is what I have been pursuing for over twenty years. Connecting science and art with hands-on learning about real issues makes me want to get up in the morning, and gives my days real joy and purpose. So, collaborating with the Montana Osprey Project these past couple of years has been wonderful. In 2016, bird whiz Dr. Erick Greene and biologist/educator Dalit Ucitel of the Montana Osprey Project asked me to make them a woodcut of an osprey for their project. Research, Education and Conservation is what they are all about. 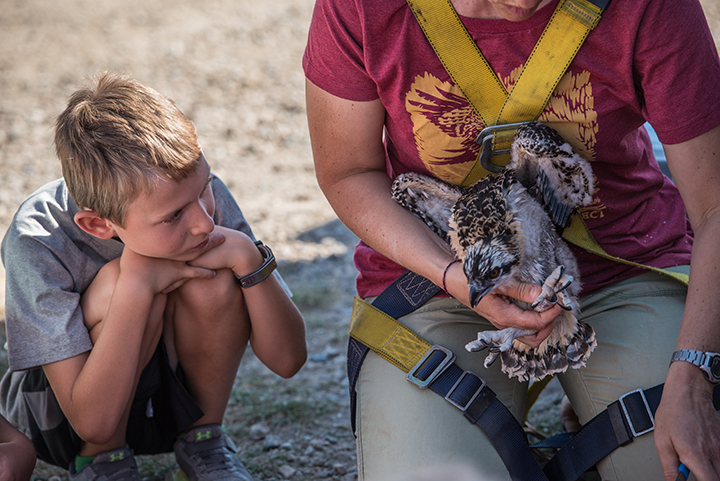 They have been studying impacts of coppermine tailings on the reproductive success of ospreys in the Clark Fork River watershed for several years. The lead, arsenic, mercury, zinc and cadmium brought to the surface by mining enter the watershed and affect all of the animals, birds and plants that live there. Inspired by the amazing osprey-hunter Stanley, who paired with Iris for a couple summers, I carved out this image of him in flight. He apparently was not the most handsome of ospreys, but he definitely rocked the fishing. An osprey without a fish cannot raise a brood, so, after seeing the ospreys in the Hellgate nest lose all of the chicks to turbid, muddy waters this Spring, I called this print Success at the Nest. I am working on putting up a detailed explanation of how I researched, designed, carved, printed and painted this print, so that will be my next entry here. I am absolutely fascinated with the creative process behind all human endeavors, so I want to spend time with this here, next week. Ever since I saw an osprey dive nearly 30 years ago into the Clark Form River from the Higgins Street bridge in downtown Missoula, and come up with a fat trout, I have been captivated by these fish hawks. Ospreys capture my imagination for a bunch of reasons: their markings are striking and easily recognizable, which appeals to both the artist and the naturalist in me. I love the strong contrast between their white and dark brown feathers, and I love the dynamic diagonal lines of their wings in flight. Their hunting requires the intriguing combination of astute observation and powerful physicality, and their dives to catch a fish will blow your mind. Check out this video of a osprey dive in slow motion. All of the profits of the sale of the limited edition original woodcut prints (12"x16") and the t-shirts go to supporting the research, education, and conservation work of the Montana Osprey Project. We are so glad that people all over the world are wearing these t-shirts, and that Erick's good work is valued by people in so many places. Just one of the many wonderful shirts that helps raise osprey conservation funds this year!